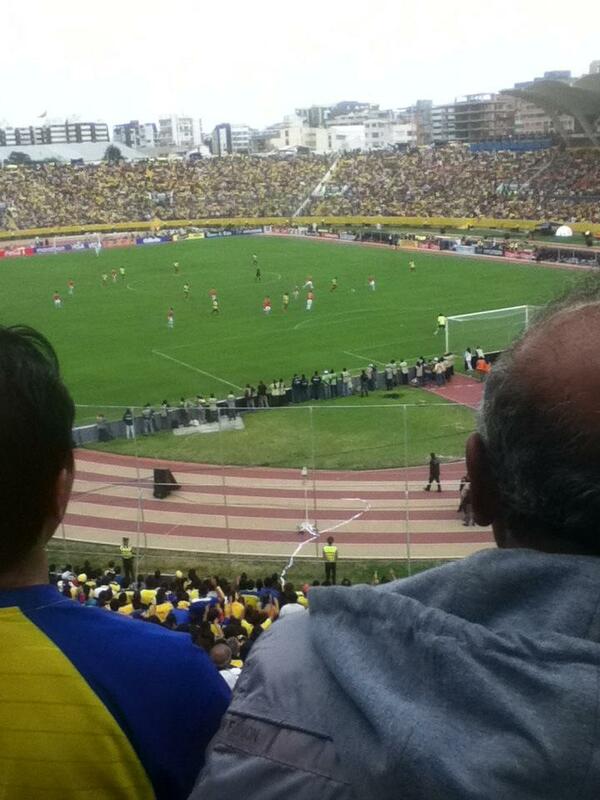 Why the Ecuadorians have it so much better on match-days. Every time I make a visit to the Atahaulpa Stadium I can’t help but make comparisons with back home. My usual judgement is that Ecuadorians have it so much better than in Scotland or the UK. There is no doubt that British stadiums are safer but there over-sterilisation and sanitisation has ruined many aspects of the modern game. Many stadiums are glorified cow-sheds, little more than four banks of seats into which fans are herded like sheep. No more apparent than this is Hampden Park where the famous Hampden roar has been replaced by the Hampden moan or muffled groan. Hampden Park got a £20 millon re-fit a number of years ago. The end result was: a dissipation of the noise, an athletics track separating the fans from the pitch by at least 10 metres, 70,000 fans became 50,000 and a severely diluted atmosphere. The Atahaulpa has not been touched for 50 years and the atmosphere is electric. The capacity has been reduced to 35,000 recently and you have the athletics track but it doesn’t dampen the enthusiasm. On Friday my Dutch friend and I made our way through the fans, police and many touts. After a couple of aborted entries we finally managed to reach the general area of our seats but not before buying beers at the back of the stadium. As the game was already 5 minutes old and we didn’t want to annoy the other patrons in that dreadful cinema like shuffle through the crowds we stayed-put, aside the beer stand. Everyone in the back row of seats (which is really a long, concrete block) were standing for a better vantage point. Behind them was a line of Police, some with dogs, all with batons and behind the Police I stood with my friend.Both of us a good foot taller than the rest. In the two hours we stood there sipping our beers not one Policeman or woman asked us to move, sit down or find our seats. 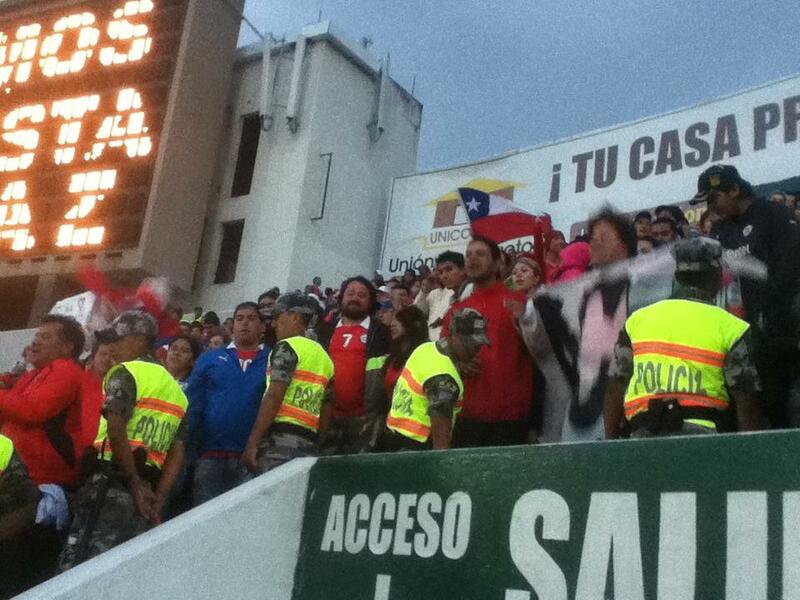 We were causing no problem nor blocking access, simply watching the game so the authorities left us alone. (The only hairy moment was when one of the Police Alsatians started to attack an imaginary assailant. Many wide eyed fans turned and looked on fearing that it could cause some dreadful chain reaction of biting hounds.In the end the mutt was shepherded away to safety). And therein lies the biggest difference between the match experience in Latin America and the United Kingdom. In Scotland you are constantly harassed by over-blown security guards and zealous quasi-authorities either wanting you to sit-down, pipe down or calm down. Some luminous jacketed dolt, who was too fat to become a real policeman or too dim to secure a respected job has to use his/her two hours of authority to dampen your match day experience. And its only the proper fan who rises to remonstrate at the referee or roar his football song that gets reprimanded. If a burly troglodyte is shouting abuse or sectarian or racist bile the security guards are nowhere to be seen. The cowards only admonish the normal fan, knowing fine they won’t receive a smack in the mouth or verbal tirade in response. 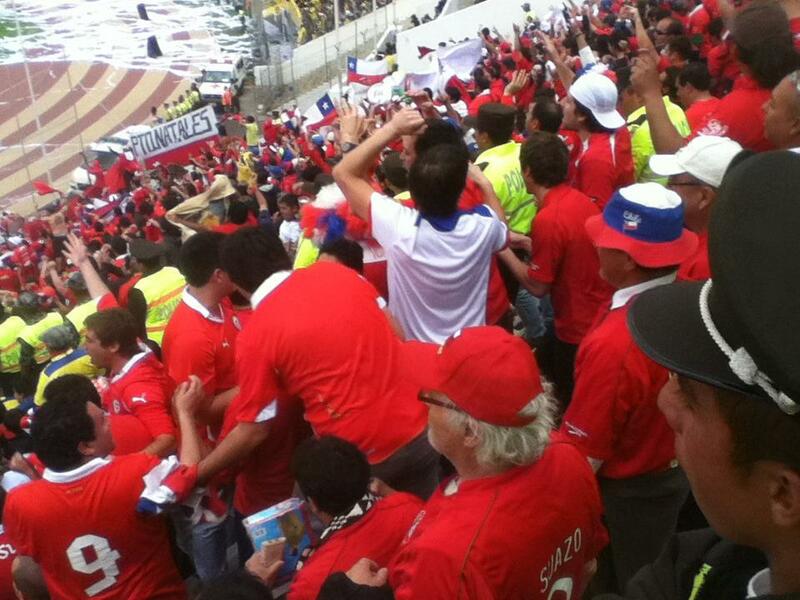 On Friday, the Chilean supporters were situated right beside us, numbering about 2-3000 and they regularly intermingled on their way to the toilet or to get some food or more beer. There was no cordon of yellow nor line of Police, even when Chile took the lead there was little more than muffled insults and derogatory, hand signals. In the end Ecuador won 3 – 1 to bolster their qualification chances for Brazil 2014. As the Ecuadorian fans shuffled out of the stadium many insults were traded with the glum looking Chileans. The usual cries of “chuta- madre” and “hijo de la chingada” were exchanged along with self-explanatory gestures that even a nun would understand. In Scotland you would be probably hauled off to the Chateau D’If for such “anti-social” behaviour. Ecuadorian football may have many flaws but I’d have their match-days, any day compared to the over-priced and over- bearing experience of home. Football in Ecuador maybe like football in Scotland 30 years ago. Not such a bad thing considering where we are as a football nation now. nice. I always thought it odd that the redesign of Hampden included the athletics track, despite the obvious fact that in stadia where the fans are “on top of” the players, the atmosphere can often overwhelm the away team (like at Tynecastle!!!). A team that has clearly learned from this situation is Juventus, who seem to have benefited rapidly from the change from the Stadio Delli Alpi to their new abode. Also, I am personally saddened that the derbies in Glasgow and Edinburgh cannot see fans mingling in the ground, which is something that the Liverpool teams seem to be able to do with ease.